Dr. Qazi Kholiquzzaman Ahmad, Chairman, PKSF, visited Pirojpur and Gopalgonj districts from May 1 to 5, 2016 to have a first hand view of the implementation of ENRICH programme by three Partner Organizations (POs) namely ‘Dak Diye Jai’, ‘Uddipan’ and ‘PPSS’. Mr. Md. Abdul Karim, Managing Director, PKSF joined him during the Gopalgonj visit. On the 2nd May a ‘development fair’ was organized by ‘Dak Diye Jai’ at ‘Gabtola Primary & Secondary School’ of ‘Shikder Mollik’ union in Pirojpur. 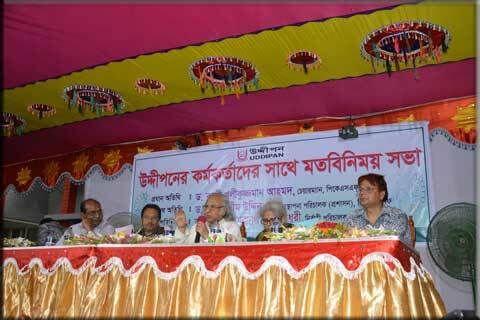 Chairman of PKSF attended the fair as the chief guest while Mr. Md. 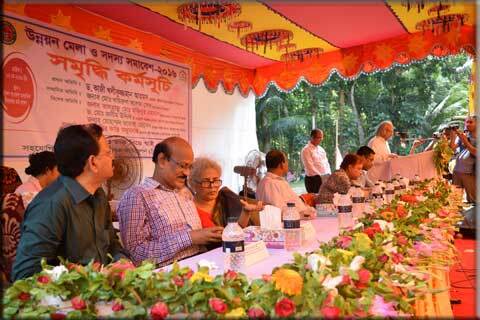 Khairul Alam Sheikh, DC of Pirojpur was present as the special guest. Among others, Mr. Md. Jamal Hossain, UNO of Sadar upazilla-Pirojpur and Mr. Md. Shahjahan Gazi, Executive Director, ‘Dak Diye Jai’ were also present. More than a thousand people characterized by the display of 20 stalls, assembled in the fair. The same day Chairman, PKSF visited activities of ENRICH programme being implemented by the PO ‘UDDIPAN’ at ‘Parer-Hat’ Union of Pirojpur. He was also present in a ‘Staff Meeting’ as the Chief Guest organized by ‘UDDIPAN’ at ‘Parer-Hat’ Union Parishad auditorium. On the 3rd May, Chairman, PKSF visited a ‘Health Camp’, a blood grouping & donation camp and attended a discussion meeting as the chief guest at ‘Kushali’ Union of Tungi-Para upazilla at Gopalgonj. A total of 750 patients were given free medical services at that health camp. These events were organized by the PO ‘PPSS’. Chairman, PKSF has also laid the foundation stone of the ENRICH Centre at Ward No-1 of ‘Kushali’ Union. On that day the honorable Chairman of PKSF visited the mausoleum of the Father of the Nation Bangabandhu Sheikh Mujibur Rahman at Tungipara at Gopalgonj. The Chairman along with the MD of PKSF paid tribute to the Father of the Nation laying a garland of flowers. Mr. Md. Khalilur Rahman, DC, Gopalgonj and Mr. Md. Khalid Hasan, Chairman, ‘Kushali’ Union Parishad were present at that time. Copyright © 2018 PKSF. All rights reserved.